I can never pass up a delicious bowl of Chicken Tortilla Soup whenever I’m at a restaurant, so I decided to make one at home I can enjoy any time I want! This soup recipe is loaded with tons of flavor and full of tender chicken, corn, salsa and has tons of flavor from the seasonings like cumin and chili powder. Plus, it’s topped with crunchy tortilla strips that I can never resist. This is the perfect quick and easy weeknight dinner plus it’s great for meal prep and tastes even better the next day for packing lunches! I love a great soup! 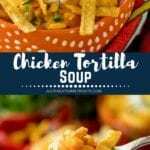 I’ve been enjoying Slow Cooker King Ranch Chicken Soup, Chicken Taco Soup and Beer Cheese Soup and now that I saw there was a Chicken Tortilla Soup I knew that was the recipe I just had to try. I’ve been looking for a recipe like this for a long time but it always seemed like a lot of work or had a few things in it I wasn’t so excited about. This soup is big and flavorful without a ton of work but it delivers big on flavor. If you love that Chicken Tortilla Soup you get at your favorite restaurant, I know you’ll love this too! It’s loaded with chicken, onion, salsa, corn and seasoned with just the right amount of cumin and chili powder. You can always add in black beans, diced tomatoes or whatever your heart desires! This one looked perfect! And I was right. It’s fabulous and so easy to make any night. 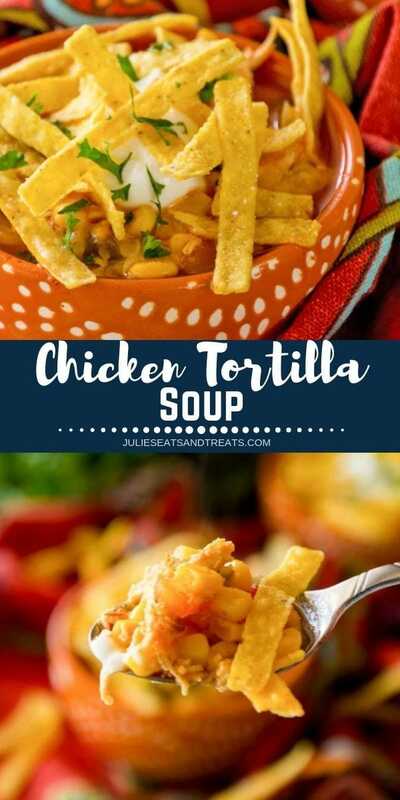 If you are like me and looking for a perfect Chicken Tortilla Soup recipe please go and make this one! Absolutely, this soup freezes great! 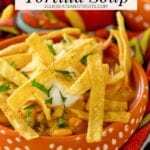 Just wait to garnish the soup with the cheese and tortilla chips until prior to serving. Is Chicken Tortilla Soup gluten-free? Omit the tortilla chips and this becomes gluten-free. Serve it piping hot so the cheese melts right into the soup. Top with tortilla chips for crunch! If you want to spice up your soup, top with diced jalapenos. More optional toppings include sour cream, cabbage and thinly sliced radishes. Diced onions and sliced olives are another great addition. Topping with pico de gallo makes for a big flavorful meal! Another thing I love about this soup is it’s great to make on the weekend and then you have lunch all week long. It’s so simple I usually double the recipe to make sure I will have leftovers because my family loves it just as much as me! If I don’t end up needing it for lunch I just throw it in the freezer and then I have a meal for another busy weeknight. Make sure to grab your FREE Freezer Meal Labels so you can label it! Heat the olive oil in large pan. Add the onion and garlic. Saute until onion is translucent. Add the cooked chicken, cumin, chili powder, chicken broth, corn, lemon juice and salsa and simmer for 20 minutes. Top with crushed tortilla chips and cheese. 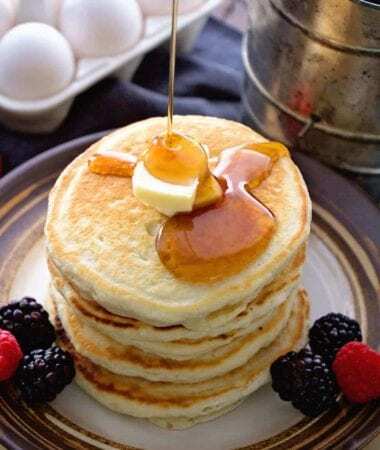 Enjoy this recipe!! And when you do be sure and leave a five-star rating below! AND if there’s a soup or a new recipe you want to see that’s not on the blog, be sure and let m know what that is. I’d love to develop a recipe just for you! Please tag me on Instagram with @julieseatsandtreats or #julieseatsandtreats so I can see your tasty soup! I love seeing all of your photos! A quick and easy soup recipe that is perfect for busy weeknights. This Chicken Tortilla Soup is loaded with corn, salsa, and chicken then seasoned perfectly with cumin and chili! Heat olive oil in large saucepan. Add garlic and onion. Cook until onion is translucent. 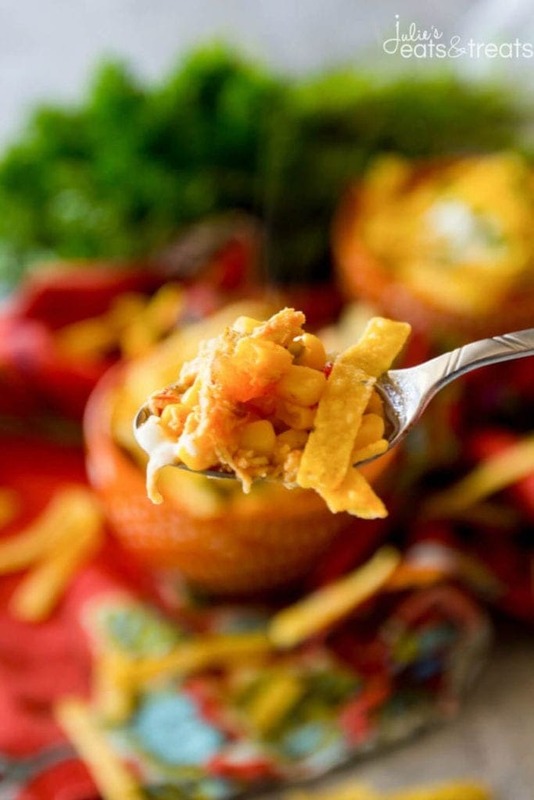 Stir in remaining ingredients except for the tortilla chips and cheese. Simmer for 20 minutes. Divide into bowls. Top with crushed tortilla chips and cheese. I guess you and I had the mexi-chicken dishes vibe going on this month. And duh, why didn’t I think of using my secret board to pin recipes. I always ‘bookmark’ them the old fashioned way so they can’t see what I’m up to. Thanks for the tip and delicious looking recipe! What a delicious looking soup! It looks like the perfect dinner for a snowy night like tonight! Love me some tortilla soup. I make a cheesier version but this looks outstanding! Good soup weather today too. Mmm a classic and perfect for Winter! This is one my favorite soups and yours looks divine! Glad to be part of SRC with you! Looks delicious! I’ve been pinning soups like crazy. What type of salsa did you use in the recipe? Fresh? Jarred? Jarred! But if you have fresh or homemade that would work to I think! I did that too! I have a secret board just to save my SRC recipes to. LOL! I was so happy when they came out with those b/c I never pinned the recipes before b/c I was afraid the person I was assigned to would see them and figure out who had them. 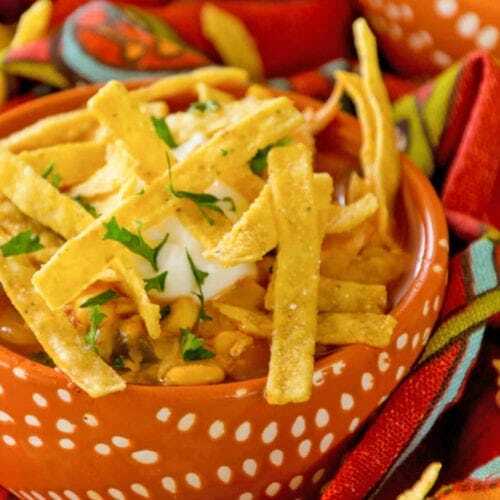 Gotta love tortilla soup–and it’s so perfect for this cold weather! Great soup – perfect for this time of year! This Chicken Tortilla Soup looks yummy! Especially today. It’s been below zero for the past two days in the Chicago area. Not fun!! I am such a sucker for soup in the winter! This looks so good! 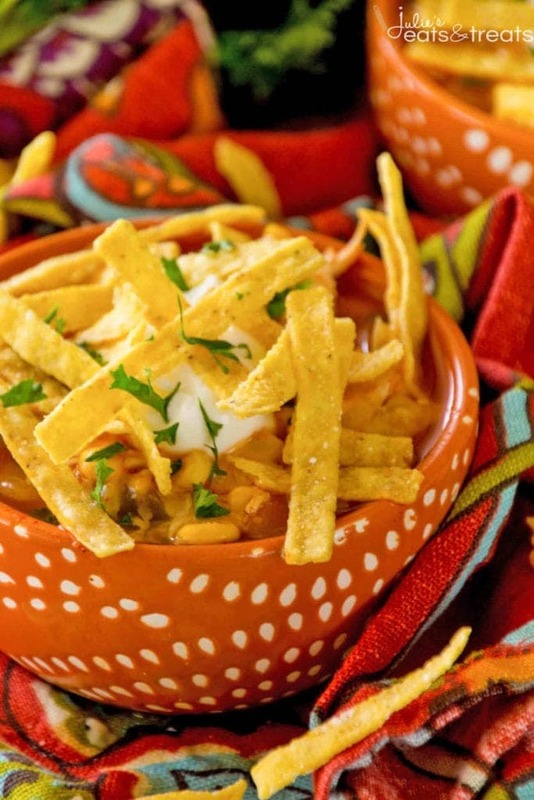 It reminds me of a tortilla soup I had in Mexico one time — just incredible! I love chicken tortilla soup! And especially right now, it’s been so cold lately! I made this over the weekend and it was a huge hit with the whole family! This is our favorite weeknight soup recipe! Ours to! So quick and easy.